The New Year began on a high note for Dubai Duty Free with the operation announcing record-breaking sales for 2017 of Dhs7.05 billion (US$1.93 billion), representing a 5.6% increase over the previous year. The sign that a remarkable year was coming to a close was evident in December when a new monthly sales record of over Dhs801 million (US$219 million) was achieved. The operation’s 34th Anniversary offer of a 25% discount on a wide range of merchandise over three days in December achieved sales of Dhs196 million (US$54 million). In 2017, the operation recorded a staggering 27.2 million sales transactions which average at 75,000 sales transactions per day, while a total of 73 million units of merchandise were sold. From a category point of view, Perfumes retained its position as the best-selling category with annual sales of Dhs1.1 billion (US$300 million), contributing 16% towards total sales at Dubai Duty Free. Liquor and Tobacco categories followed with Liquor recording Dhs1.09 billion (US$298 million) in sales, and Tobacco Dhs690.11 million (US$189 million), representing an increase of 2% and 19% respectively. Cosmetics jumped to fourth place with sales increasing by 17% to Dhs626 million (US$172 million) for the year. Other steep increases were seen in Electronics which rose by 16% to Dhs547 million (US$150 million), mainly driven by new product launches from the likes of Apple. Watches rose by 13% to Dhs518 million (US$142 million), while handbags and small leather sales rose by 16% to Dhs187million (US$51 million). Sales in Departures reached over Dhs6.1 billion (US$1.6 billion), representing 87% of total annual sales while Arrivals sales showed a 3.6% increase over last year and accounted for 10.8% of the total annual sales. In addition to a remarkable turnover, 2017 provided Dubai Duty Free with another milestones in terms of growth and expansion including the opening of new Perfumes, Cosmetics, Liquor and Tobacco areas in Concourse C to complement the retail area around the Control Tower that opened in the end of 2016, opening of a Bulgari shop in Concourse B, new retail areas for Liquor and Gifts from Dubai in the departures terminal of Al Maktoum International Airport and the opening of a new shop in the Riverland area of the Dubai Parks and Resorts. 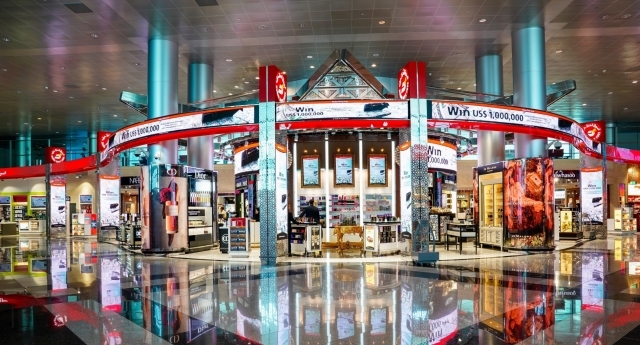 From a logistics point of view, Dubai Duty Free has continued to expand its automated warehouse facility and became the first customer worldwide to go live with an upgrade of its Oracle Retail Systems to Oracle Retail Release 16 version in July. Looking ahead, Dubai Duty Free will continue to maintain its busy events and promotional calendar which includes the Dubai Duty Free Tennis Championships to be held from 19th February to 3rd March at the Dubai Duty Free Tennis Stadium.